Over the years we have made adjustments and finally we have decided to make this into a race from participants requests but still keeping the elements of fun and awareness from the original days of when we started. Back from 2003-2006 the crafts were wind powered and then in 2008 Youth in Motion opened to all craft that were not powered by an engine and hence the birth of SUP with the crossing by Zane Schweitzer. In the early days Windsurfing was the main craft, and then Don Montague and his crew introduced the concept of a kite powering a catamaran which was incredible. From there it opened the doors to the OC6 with their kites powering the canoes across the channel. Finally in 2006 the Molokai Challenge opened the divisions up to kiters in 2005. We had to cancel in 2007 because we were short on rescue craft and were not going to take any risky chances. We had a very strict policy on rescue and our numbers had outgrown the early days. “Which ever sport the participants chose was to remind us about the essence of why a person took the sport up in the first place. This was also about how individuals progress through life, finally reflecting on their choices, and then having a chance or opportunity to give back to our youth who are the future generation. I cannot forget those adult individuals in my teenage years who helped me with my windsurfing career. Without them the opportunities would not have existed as they showed what was possible in life. This is what this event was about. The Early Days Some facts and acknowledgment should be known with the youth that participated in the first years and cannot be forgotten. The first year was almost cancelled due to 40 plus knot winds, 10-15 foot swells, but no sweat to a couple of little kids. 8 year old Connor Baxter, and 9 year old Kai Lenny showed what was possible and paved the way for other youth to follow in 2003. Baker Grant, Zane Schweitzer and some kids form Russia are just a few who followed the tradition of youth making this crossing. The parents of these kids had no choice but to made the crossing as their chaperones. We cannot forget their parents as if it was not for them, these youth would not have been allowed to cross the channel. However most of the youth out sped their parents as they closed in to the shores of Molokai! 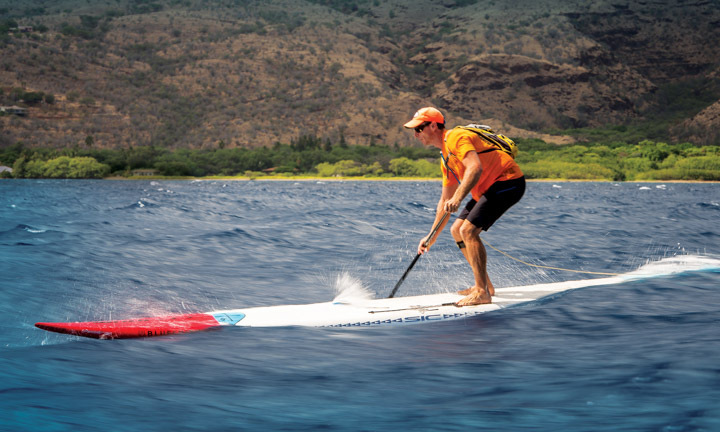 IN 2008 Zane Schweitzer chose to do SUP one year and raised a bunch of money for the youth. 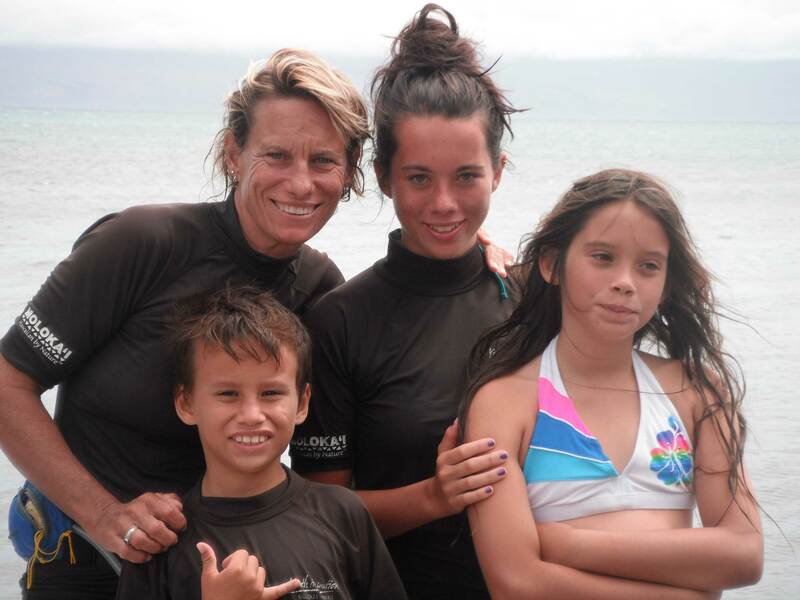 Zane and Elle Cochran formed their SUP relay team with Zane’s Mom Shawneen Schweitzer. For 2010 the format went back to the same concept of 2003, with the exception that this is a team event because of the safety and rescue costs. This is not a race as this is about giving back to the sports with a spirit of wanting to show the future generation that opportunities exist in this world. 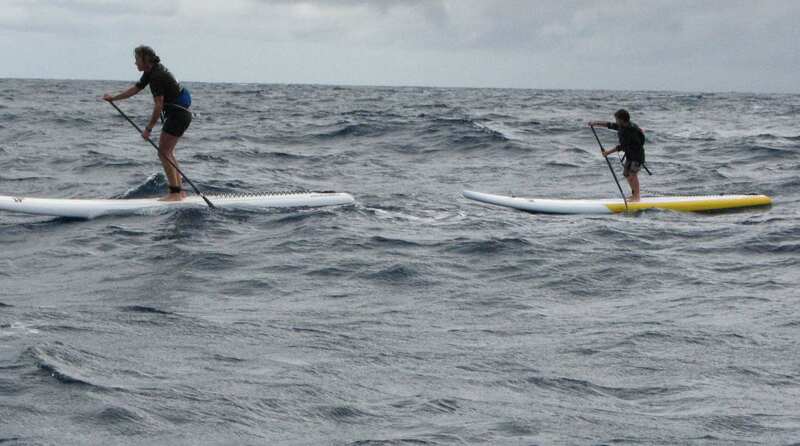 In 2010 it was decided there would be no channel crossing, but instead a downwind run from Kamalo to the Wharf on SUP's consisting of a 10 mile paddle. 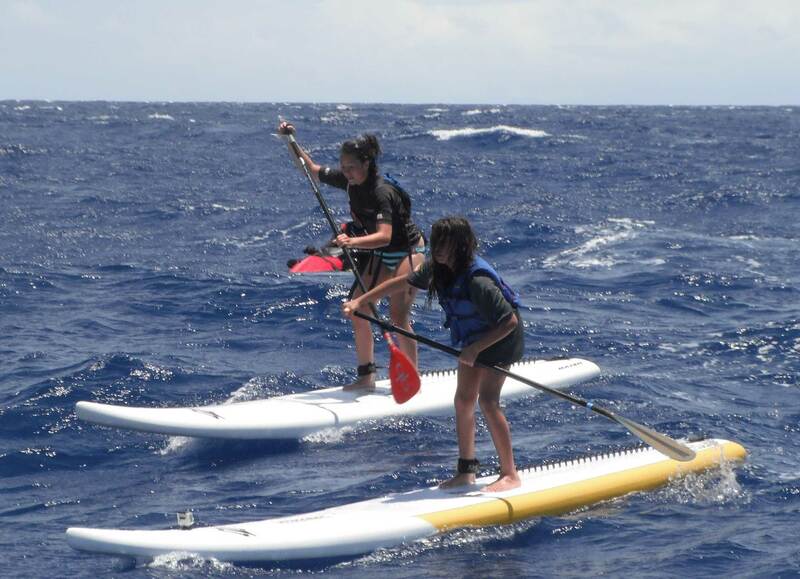 Kids as young as 8 years old did this paddle with younger kids joining in at Hotel Molokai to make the final 2 miles. Elle Cochran came over from Maui in support of this event and helped the Youth In Motion kids raise over $1000. 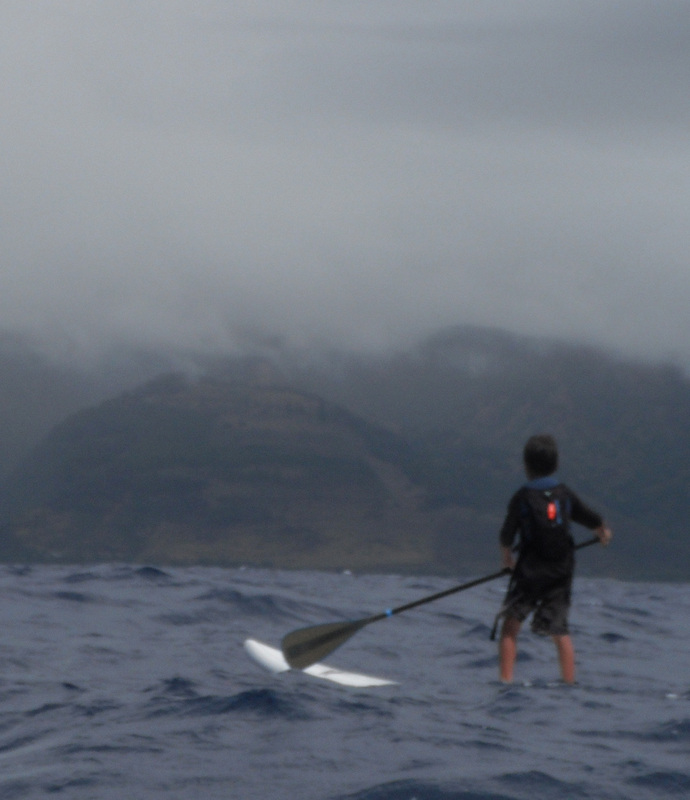 In 2011 the same kids that includes Molokai's Alex Mawae (9yrs old) that did the 10 miles in 2010 trained hard over this course of the year to paddle from Maui 2 Molokai.Youth In Motion formed their own SUP team to make the channel crossing as they followed in the footsteps of Connor, Kai, Zane and Baker. Over the years challenges arose as the event grew from a small idea to one of the best ocean crossings in the world. The past two years it has been going back to the drawing board as this event has been totally run by volunteers and with reality life, children, and family took over and hence the volunteers had to step down. 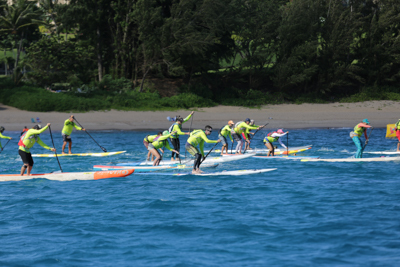 Due so many paddling events popping up, Youth in Motion decided to take a break due to logistics but it was finally decided in 2015 that it was important to continue on and this time bring the event back as a race to Kaunakakai. The same concept of why this crossing started is there and its Youth in Motion aka Stand Up Paddle Association desire to make this a fun event but yet competitive. 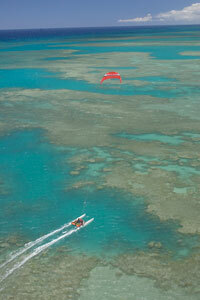 We look forward to seeing all of for a fun weekend on Molokai. For those that are choosing to stay on, well I think you will be more that happy that you chose to get to know our island community rather than knowing it as a start and finish stop.